Those of us who own a home or have had to clean hard, outdoor surfaces know how difficult and messy the process of pressure washing can be. Traditionally, pressure washers have only been able to clean an area of just a few inches with the pass of the wand, making pressure washing extremely time consuming and tedious. Moreover, many pressure washers only work effectively if they’re held at exactly the perfect distance from the surface you’re cleaning, which can turn a job that shouldn’t require much effort into one that is laborious and slow. Lastly, it’s important to note that pressure washers tend to waste a great deal of water, losing it to evaporation in the process of cleaning. 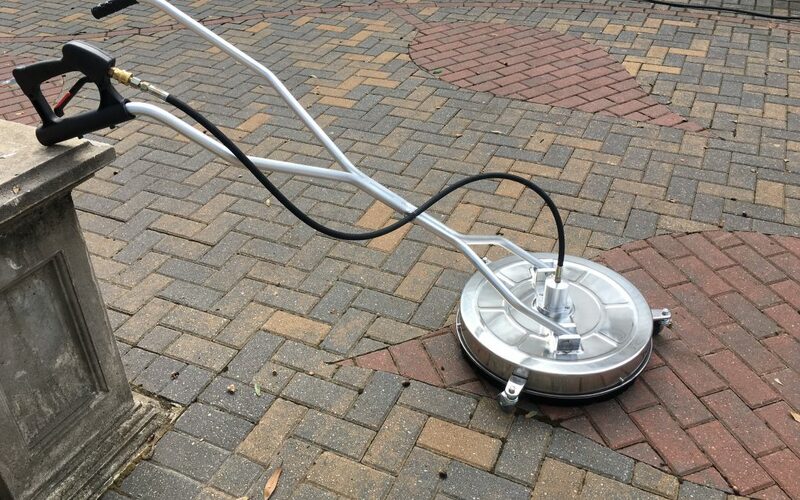 If you’re struggling with power washing and are desperate for a better way to achieve the same end result, I highly suggest investing in an attachment for your power washing device that is called a Sidewalk Scrubber. Sidewalk Scrubbers work by attaching to your traditional pressure washer and are essentially a dome with rotating pressure-washing heads inside. As an add-on to your washer, a Sidewalk Scrubber keeps the pressure heads at precisely the optimal height, and the rotation allows you to clean a large area simply by passing your machine over it once. This mechanism actually allows you to clean about eight times faster than it would take you with a traditional pressure washer alone. So, then, with the simple addition of a Sidewalk Scrubber to your machine, you can greatly reduce the amount of time you spend cleaning, minimize the energy necessary to effectively clean your surface, and dramatically reduce the amount of water that you’re consuming to complete this chore. If you’re looking for advice about what size scrubber you should buy, I recommend visiting Ultimate Washer online, which has a very friendly staff who can guide you to the right size scrubber for you based on the PSI rating on your pressure washer. And if you’d like to watch an interesting video I found comparing these two methods of washing outdoor surfaces, you can view one at this link. Thanks for stopping by, and good luck with your pressure washing!